The heart is relatively intolerant of a chronically elevated diastolic pressure and can respond by a slippage of the mechanical attachment of the ventricular muscle cells to each other at the intercalated discs. 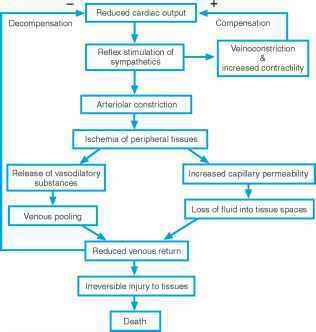 This process can occur in a matter of hours after the sudden appearance of an elevated preload and will cause an increase in diameter and decrease in wall thickness of the ventricular lumen. Such a heart is said to be dilated. The actual mass of the dilated heart is unchanged, unlike the case of hypertrophy, for which the mass is increased. Because of the Law of LaPlace (see Chapter 13), a dilated heart is at a severe mechanical disadvantage, and dilation is therefore a serious complication for the failing heart.